Looking for Things to Do in Nelson? 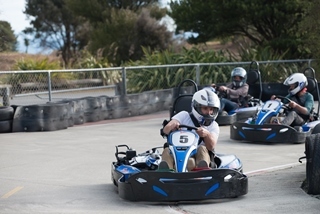 Come down to Pro Karts at Tahunanui Beach and have a race on our go karts, one of the most exciting & fun activities in Nelson. 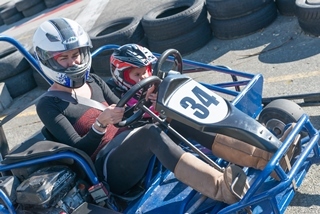 Pro Karts is located next to the Nelson Fun Park, laser tag, mini golf, bumper boats, megaslide and hydroslide as well as our upmarket go karts. With all these activities in one place, this is the best location for kids & adults of all ages for fun and exciting things to do in Nelson, New Zealand. During all school holidays, we are open 7 days a week. So on those infamous "There's nothing to do" days, just bring the kids down and you can count on us to kill the boredom! We are even open on wet days!! For Grand Prix & Bathurst events we can open inside or outside our normal trading hours & days. Also new to Pro Karts is laser tag check out Pro Combat laser tag and come down and make a day of it!! We now have 3 different go karting option at Pro karts, our Pro Karts for everyone 12 years and over, Fun Karts for anyone, adults and children 7 years and over, and also now our new Two Seater Go Karts for kids 3-8 years of age and an adult. Our new Two Seater Go Karts race at the same time as our Fun Karts. We have recently brought in some new options for our Arrive and Drives on our Pro Karts and Fun Karts. If you have a large group you are wanting to bring, feel free to contact us and we may be able to offer you a discount. If you make a booking with us you need to be there 20 minutes beforehand. SAVE ON ANY PRO KARTS OPTION WHEN YOU PRE-BOOK AND PAY ONLINE. Please note: All rides and options are non-refundable. 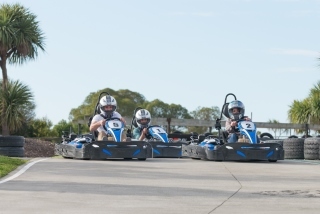 SAVE ON ANY FUN KARTS OPTION WHEN YOU PRE-BOOK AND PAY ONLINE. SAVE ON ANY TWO SEATER KARTS OPTION WHEN YOU PRE-BOOK AND PAY ONLINE.